Click on the button above to see a video using a revolutionary saddle designed to help people with severe physical challenges, paralysis and amputations ride safely and independently. We are now using this saddle at Tailored Rides. Our mission is to provide a safe and welcoming environment where each member of our community is able to enhance their quality of life through interaction with horses and nature in a positive, relaxing and nurturing environment. Equine assisted activity (EAA) encompasses a wide range of treatments that includes activities with horses and other equines to promote physical, occupational, and emotional growth in persons with neurological diseases or disorders such as cerebral palsy, movement disorders, or balance problems. It is believed the rhythmical gait of a horse acts to move the rider's pelvis in the same rotation and side-to-side movement that occurs when walking; the horse's adjustable gait promotes riders to constantly adjust to encourage pelvic motion while promoting strength, balance, coordination, flexibility, posture, and mobility. EAA have also been used to treat other disabilities, such as autism, behavioral disorders and psychiatric disorders. It is used as exercise to improve sensory and motor skills for coordination, balance, and posture. Equine assisted activities (EAA) are not designed or intended replace more commonly used treatments; rather, they are considered complementary and adjunct interventions in addition to more traditional forms of therapy. TAILORED RIDES is a PATH Int'l MEMBER CENTER and adheres to the PATH Intl standards. 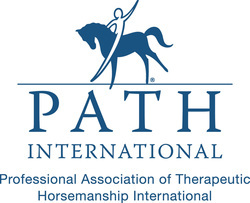 ﻿The Professional Association of Therapeutic Horsemanship International (PATH Intl) accredits centers providing a variety of services to people with developmental disabilities, physical challenges, and mental health issues. PATH activities are based on an educational model; skills are taught to riders, vaulters and students. The professional guiding the experience is a specially-trained, PATH-certified instructor. Accreditation is voluntary and the process is a peer review system. A center that meets the accreditation requirements based on the administrative, facility, program and applicable special interest standards becomes a PATH Intl. Center. In addition to therapeutic equitation, a center may offer any number of equine-assisted activities and therapies, including Hippotherapy, equine facilitated mental health, driving, vaulting, trail riding, competition, ground work or stable management. Tailored Rides currently operates with one PATH-certified instructor & is a PATH, Intl Member Center. ​ click on the seal to visit GuideStar and view our profile and status.